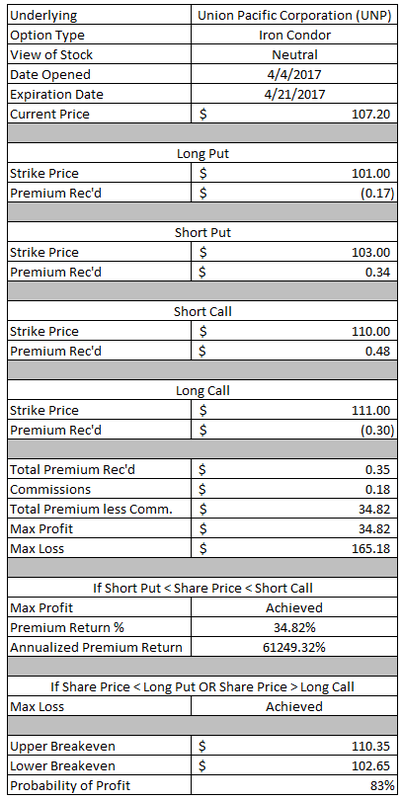 Yesterday's option recap covered just the closed positions from last week. Since last week turned into a very busy week with nearly 30 different moves being made I needed to split the weekly recap into 2 posts. Without further ado here are the new or managed positions from the week of April 3-7. This was another one of those short term plays I was making in order to try and capture some upside or reduce my cost basis. 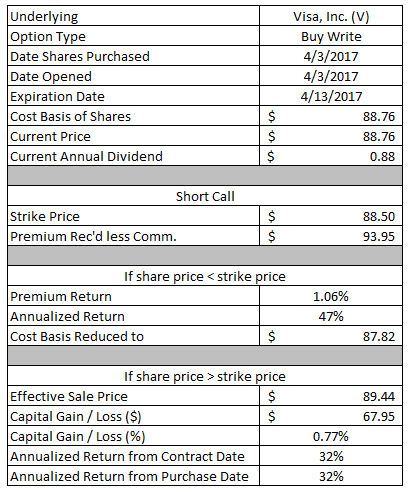 I purchased 100 shares of Visa in my Rollover IRA for $88.76 per share while simultaneously writing a covered call with a strike price of $88.50. The thought behind this is that by selling an ATM call I get the most reduction in cost basis via the option premium should Visa's share price drift a bit lower. This also has the added benefit of Visa announcing earnings towards the end of April so I should be able to write at least one more call option on the shares in order to reduce my cost basis. Since I don't think Visa is a screaming buy at these levels I'm more than happy to just collect some option premium and have the shares called away. If Visa's share price falls below the $88.50 strike then I'll keep the $93.95 of option premium as profit. That would represent a 1.06% return based on the $88.50 strike price. If Visa's share price remains above $88.50 then I'll have to sell my 100 shares at an effective sales price of $88.50 plus the option premium. That brings the sales price to $89.44 and would provide a decent $67.95 profit or 0.77% return. Either way this works out I'll be happy although secretly I hope Visa drifts slightly lower to close at $88.49 on Friday. That would let me reduce my cost basis, keep the shares and write a second call option on Visa with the higher earnings related option premium. Well my plan was to wait to put on another position in Bank of America until the eve of earning, but I just couldn't help myself. In regards to the big banks I think Bank of America is trading at the best value and offers a lot of dividend growth potential stemming mainly from an increase in their payout ratio which has been limited since the financial crisis. If Bank of America's share price falls below the $23 strike then I'll have to purchase shares at an effective purchase price of $22.55. The yield at that level isn't fantastic at just 1.33%, but the valuation looks solid. The trailing P/E would be 15.0x while the forward P/E based on the current years' estimates would be 12.9x. My purchase price would be at a 2.7% discount to the price shares were trading at the time the position was opened. If Bank of America's share price remains above $23 then I'll get to keep the option premium as profit. The $44.95 option premium would be a solid 1.95% return on the $2,300 of capital securing the contract or a 55.6% annualized return if held through expiration. I've been trying to branch out to other strategies than my usual short put option mainly in the form of defined risk spreads. The iron condor might have an imposing name, but essentially it's just a strategy that says the underlying's price will stay within a range. If that happens you keep the option premium as profit. If not then you know the maximum amount of risk that you're taking so the losses are limited. The total credits that I received from this iron condor is $34.82. I staggered this one a bit, on accident because I was checking several possible iron condors, so I have a $2 wide put spread and a $1 wide call spread. That's not horrible, but it does change the risk/reward profile. The maximum loss would be $165.18. If Union Pacific's share price stays between the $103 short put and the $110 short call then all 4 contracts would expire out of the money. That would mean I'd get to keep the full option premium as profit, so the $34.82 credit would be a 21% return on the $165.18 at risk. The probability of profit on this trade is a solid 83%. Using the delta's as a secondary gauge of probability there's approximately a 60% chance that Union Pacific's share price remains between the 2 short strikes. I opened up a couple of iron condors on Johnson & Johnson as well. Obviously I have a fairly neutral outlook on Johnson & Johnson's share price mainly because it's had a fairly large move over the last couple months. The maximum profit that I can make on this trade is the credit that I received or $29.82. The maximum risk/loss is the width of the spreads, $1.00, less the credit received or $70.18. I'll achieve the maximum profit if Johnson & Johnson's share price remains between the $123 and $129 short strikes. If that happens the $29.82 in option premium would be a 42.5% return on the maximum amount at risk. The maximum loss will occur if Johnson & Johnson's share price falls below the $122 long put option or rises above the $130 long call option. The probability of profit on this trade is right around 70%. Using the short options delta's as a probability gauge puts the odds at 54% that Johnson & Johnson remains between the 2 short strikes. While the iron condor is a neutral strategy, the put credit spread is a bullish one. Well, neutral to bullish. By creating a spread as opposed to just a short put option the risk becomes defined. So in other words I know exactly how much I stand to make or lose depending on where Target's share price is at expiration. My general thesis behind putting this position on is that Target's share price has been absolutely beat up over the last couple months. Just about 6 months ago it was up in the mid $70's, about 2-3 months ago it was in the mid $60's and now it's down to the low to mid $50's. Yikes! Essentially I'm betting that the share price is bound to retrace a bit and move back higher. The maximum profit that I can make on this position is the $31.91 credit that I received. The maximum risk that I'm taking is the width of the spread, $1.00, less the credit or $68.09. Maximum profit will be achieved if Target's share price remains above the $53 strike of the short put option. If that happens both contracts would expire out of the money. That would represent a 31.9% return on the $1.00 spread width. The maximum loss will be achieved if Target's share price falls below the $52 strike of the long put option. Since purchasing shares in V.F. Corporation in my Rollover IRA back in January I've been trading options around the position in order to reduce my cost basis. My go to strategy has been the covered strangle where you sell an OTM call and put option while owning shares. Since you sell 2 option contracts you collect more premium up front, but that comes with the risk of either adding another 100 shares to your position or having to sell your shares. Thus far I've used options to further reduce my cost basis by $172.59. Or in other words my original cost basis was $53.50 per share and through the use of options it's been reduced to $51.78. If V.F. Corporation's share price falls below $52.50 then I'll have to purchase an additional 100 shares of the company at an effective purchase price of $50.50. The new lot of shares would have a YOC of 3.33% and would be purchased at a 6.6% discount to the current share price. My cost basis for the entire position would be reduced by 1.23% to $51.14 per share. If V.F. Corporation's share price remains between the 2 short strikes, $52.50 and $57.50, then I'll get to keep the full option premium as profit. The $199.90 of option premium would be a 3.81% return on the $5,250 of capital securing the put portion of the covered strangle. If V.F. Corporation's share price rises above the $57.50 strike of the call then I'll have to sell my current shares at an effective sale price of $59.50. That's a tradeoff I'm willing to make since the share price would have to increase over 6% in order for that to happen and would generate a 14.9% return. At the current price levels I'm not really interested in adding shares of Lowe's Companies into my portfolio. However, that doesn't mean that I don't want to keep them front and center in my watch list so I decided to put on a neutral to bullish trade to keep my attention on the company by opening a short put credit spread. The maximum profit that I can make on this position is the net credit that I received or $29.91. The amount of capital at risk is the width of the spread, $1.00, less the credit received or $70.09. The maximum profit will be achieved if Lowe's share price remains above the $81.50 strike price of the short put option. If that happens both put options would expire out of the money and I would get to keep the credit as profit. The $29.91 credit would be a 29.9% return based on the $1.00 width of the spread. The maximum loss would be achieved if Lowe's share price falls below the strike price of the long put option or $80.50. The probability of profit on this position is 70%. I mentioned earlier that I'm fairly neutral on Johnson & Johnson's share price given the fairly large increase in price over the past month or so. Also, with earnings approaching later this month I think Johnson & Johnson will just kind of meander around the current share price thus my desire to put on a neutral option strategy. The maximum profit that I can make from this iron condor is the net credit that I received upon opening the position, $21.82. The maximum risk on this position is the spread width, $1.00, less the credit received or $78.18. The maximum profit will be achieved if Johnson & Johnson's share price remains between the 2 short strikes, $124 and $127, between now and expiration. If that happens all 4 contracts would expire OTM and the credit received would be profit. The $21.82 credit would represent a 27.9% return on the maximum amount at risk. The maximum loss will occur if Johnson & Johnson's share price falls below the $123 strike of the long put option or rises above the $128 strike of the long call option. The probability of profit on this trade is right around 78%. 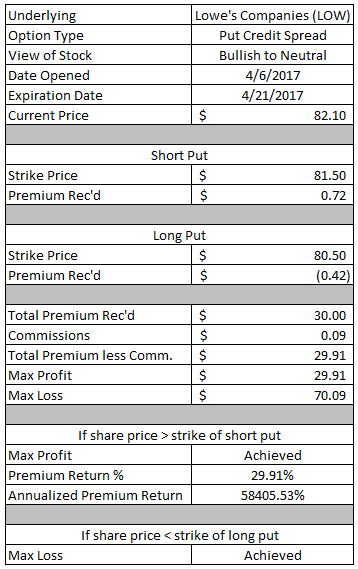 Using the short options delta's as a probability gauge puts the odds at 29% that Johnson & Johnson remains between the 2 short strikes. 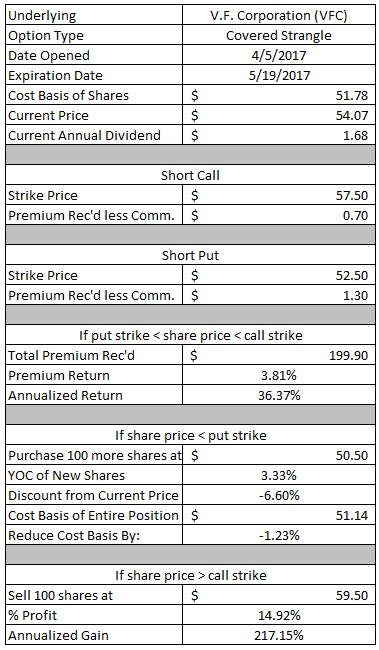 Since having shares of United Parcel Service put to me back in April I've been trading options around the position in order to take in more option premium to reduce my cost basis. I've primarily been sticking with covered strangles; however, after closing that position last week and with earnings on deck later this month I wanted to go with a short term defined risk neutral strategy thus the short iron condor. The maximum profit on this short iron condor is the net credit received upon entry or $25.82. The maximum amount at risk is the spread width, $1.00, less the credit received or $74.18. The maximum profit will be achieved if United Parcel Service's share price remains between the 2 short strikes $103 and $108 between now and expiration. If that happens I'll keep the option premium as profit which would be a 34.8% return based on the maximum amount of risk that I'm taking. The maximum loss will occur should United Parcel Service's share price rises above the $109 long call or falls below the $102 long put option. The probability of profit on this trade is around 74%. Using the short options delta's as a probability gauge puts the odds at 60% that United Parcel Service's remains between the 2 short strikes. Apple is one of the most widely followed and traded companies out there and as such the options market is very liquid. Since I only own a handful of shares within my Loyal3 portfolio I wanted to get a bit more exposure to the company; however, a regular put option wasn't really doing it for me. So I went with a put credit spread which is a neutral to bullish strategy. The most that I can make on this position is the $35.91 net credit received at order entry. The most that I can lose is the width of the spread, $2.00, less the credit or $164.09. As long as Apple's share price remains above the $141 strike of the short put I'll achieve the maximum profit. The $35.91 in option premium would be a 18.0% return on the $2.00 width of the spread. The maximum loss will be achieved if Apple's share price falls below the $139 strike of the long put option. At order entry the probability of profit on this position was 82%. Using the delta of the $141 short put, 0.2735, puts the probability of achieving the maximum profit at 73%. 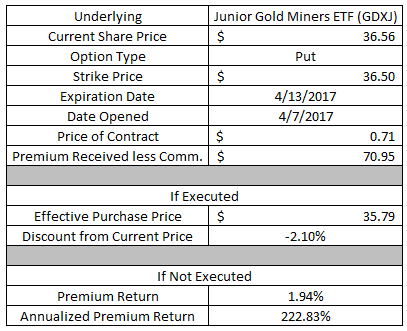 With the great success of selling an at the money put option on the Junior Gold Miners ETF last week, I decided to go back to that well another time. I like GDXJ for options because the implied volatility is quite high and it should also offer some protection should the markets make a move down. If GDXJ's share price falls below the $36 strike of this put option then I'll have to purchase shares at an effective purchase price of $35.53. At that level I'm just fine owning the shares because gold related investments have more perceived risk to the upside, in other words the call option cost more than the equivalent put options. If GDXJ's share price remains above the $36 strike then I'll get to keep the full option premium as profit. The $46.95 in option premium would be a 1.30% return based on the $3,600 of capital securing the contract. 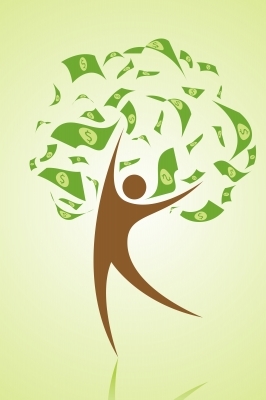 The annualized return would be a massive 120% since it would be earned in just 1 weeks' time. One put option in GDXJ just wasn't quite enough for me so I went with another one as well. I was a bit more aggressive with this one by selling the true at the money put option which provided a lot more option premium, but was essentially a 50/50 shot as to whether it would be in the money or not. If GDXJ's share price falls below the $36.50 strike of this put option then I'll have to purchase 100 shares of the ETF at an effective purchase price of $35.79. That would be at a 2.1% discount to where the share price was trading at the time the position was opened. 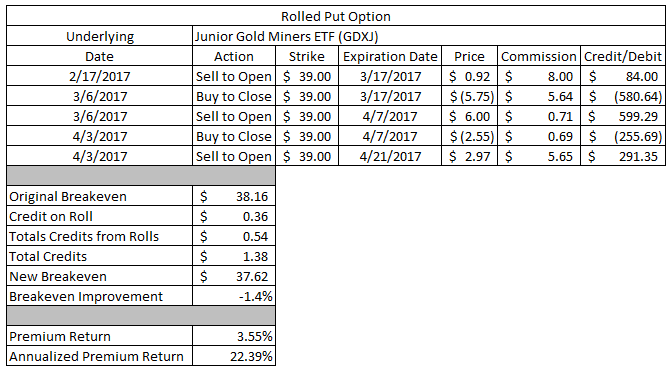 If GDXJ's share price remains above the $36.50 strike of the put option then I'll get to keep the full option premium as profit. The $70.95 option premium would be a 1.94% return on the $3,650 of cash securing the contract. That's a whopping 223% annualized return. Of course that comes with the caveat of it essentially being a 50/50 shot. I typically don't like to roll my positions; however, sometimes that's the best thing to do. In this case there wasn't any real advantage to taking ownership of the shares so the best move was to roll the position out in time and collect an additional credit. I specifically chose the April 21st expiration because it potentially has 2 more rolls if need be prior to the earnings release the first week of May. I was able to collect an additional $16.91 credit by rolling the position out 2 more weeks which reduces my breakeven price by 0.5%. The total credits received on this put option are up to $0.72. If Pfizer's share price rises back above the $34.50 strike price of the put option then I'll get to keep the full credits received as profit. 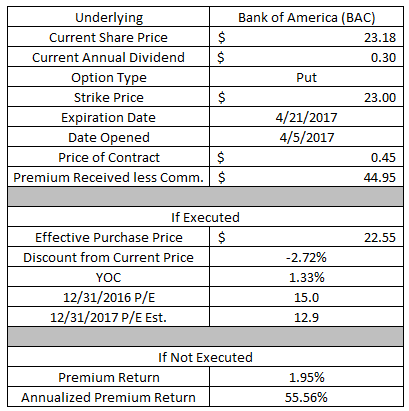 The $71.86 in option premium would be a 2.08% return on the $3,450 in capital securing the contract with an annualized return through expiration of 16.3%. This position has been a thorn in my side for a while. I originally opened a $39 strike put option on GDXJ in my taxable account back in mid-February and here we are approaching mid-April and it's still here with me. This position has now required 2 different rolls out in time; however, I've been able to do so for a decent sized credit each time. I still need a lot of help from GDXJ and need it to start climbing and at least get close to the $39 strike in order for this to be a profitable move; otherwise another roll will be coming later this month. 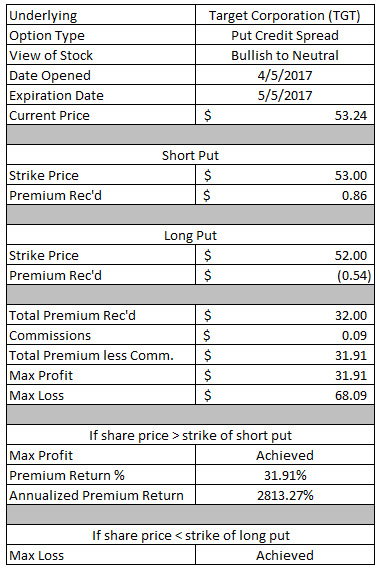 By moving the contract expiration out in time by 2 weeks I was able to collect an additional $35.66 in option premium. This brings the total credits received, from the opening and 2 rolls, to $138.31. My original breakeven price was at $38.16; however, with the additional credits received from rolling the position out in time it's now down to $37.62. If GDXJ manages to climb back above the $39 strike by expiration I'll get to keep the full option premium as profit. The $138.31 in net option premium would be a 3.55% return on the $3,900 of capital securing the contract. Despite having to continually push this out in time the annualized return would still be a healthy 22.4%. 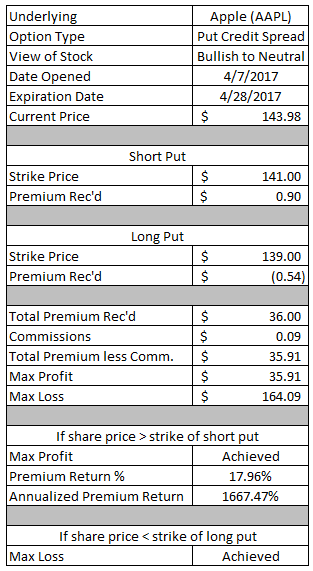 April has gotten off to a bang with $453.58 in option profits. That's nearly 50% of what I was able to make in March so it's great to see things moving my way. Thus far in 2017 I've made $4,520.33 in option profits.